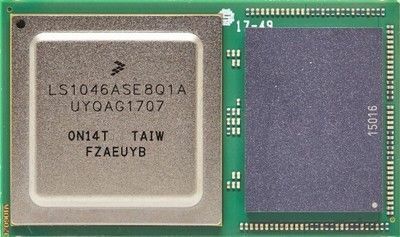 Teledyne e2v has revealed the QLS1046-4GB, an ultra-compact computing module combining the NXP LS1046 Arm(R) based processor with 4GB DDR4 memory on a custom substrate. HONG KONG, June 11, 2018 - (Media OutReach) - Just two years since the launch of the first prototype of the Qormino(R) family, Teledyne e2v has announced the QLS1046-4GB, the next module to join what has become an established line of computing modules. The Qormino(R) concept is to reduce time-to-market for system designers by offering a plug and play processor and memory module in a compact form factor for ease of adoption across different system designs and enables up to 35 percent PCB savings versus traditional offerings. The next Qormino(R) module will integrate NXP's QorIQ(R) LS1046 that features a quad Arm(R) Cortex A72 processor known for its power efficient architecture and market-leading compute density. This processor, combined with 4GB DDR4 memory including 8 bits ECC, Teledyne e2v's proven experience qualifying solutions up and beyond military temperature grades and the device's ability to function with Real Time Operating Systems, makes the QLS1046-4GB a highly versatile COTS processing solution for the most demanding Hi-Rel applications. "Teledyne e2v has been a valued partner bringing our commercial processors to High-Reliability applications for many years," commented Altaf Hussain, distribution marketing manager, NXP Semiconductors. "We are excited to see Teledyne e2v integrate the LS1046 into a new Qormino(R) module to support our mutual customers." Using state-of-the-art assembly techniques and IC design knowledge, Teledyne e2v mounts the key components to its custom substrate and retains the processor's high-speed communication performance, whilst reducing the typical form factor required to perform this level of computing by more than 1000mm2. The QLS1046-4GB will be available in Q4 2018 and qualified in multiple temperature grades, to ease adoption in aerospace programs. Thomas Guillemain, Marketing and Business Development Manager of Digital Processing Solutions at Teledyne e2v, said, "We understand that for our customers, time-in-market can be just as important as time-to-market, that's why not only are the Qormino(R) modules pre-qualified to aerospace and military industry standards, they're available through our obsolescence management program SLiM(TM). Often, in aerospace and military programs, some processing solutions are obsolete before the project takes flight, and our SLiM(TM) program guarantees supply and pricing for 15+ years, and has been a proven Teledyne e2v offering for decades". The QLS1046-4GB is the second member of the Qormino(R) family, following the recent release of the QT1040-4GB, qualified and available today, based on NXP's T1040 and 4GB DDR4. Qormino(R) will be present on NXP's booth located in Hall4A, stand 220 at Embedded World in Nuremberg, Germany this week. Visit www.teledyne-e2v.com/Qormino to find out more about the Qormino(R) line.